Doge's Palace, also known as the Palazzo Ducale, is one of the most famous buildings in Venice. Situated on the grand Piazza San Marco, the palace was the home of the Doge (ruler of Venice) and the seat of power for the Venetian Republic, which lasted more than 1,000 years. Today, the Doge's Palace is one of Venice's must-see museums. A visitor could easily get lost marveling at all of the paintings, statues, and architecture of the Doge's Palace. The chief architect of the Doge's Palace was the mastermind behind the open arcade that defines exterior the palace's ground floor. He was also responsible for designing several arcade sculptures, including "Noah's Drunkenness," depicted on the corner of the south façade and allegorical tondos (roundels) depicting Venetia on seven of the arcades facing the Piazzetta. Built in 1438, the "Paper Gate" is an entrance gate between the Doge's Palace and the Basilica of San Marco. Architect Bartolomeo Buon embellished the gate with spires, carved trefoils, and handsome statues, including one of a winged lion (the symbol of Venice); the gate is a magnificent example of the Gothic style of architecture. Theories as to why the portal was named the "paper gate" are that either the state archives were housed here or that this was the gate where written requests to the government were submitted. Just beyond the Porta della Carta is the Foscari Arch, a beautiful triumphal arch with Gothic spires and statues, including sculptures of Adam and Eve by the artist Antonio Rizzo. Rizzo also designed the Renaissance style palace courtyard. This grand staircase leads up to the main floor inside of the Doge's Palace. It is so called because the top of the Giants' Staircase is flanked by statues of the gods Mars and Neptune. Work on the "golden staircase," which is decorated with a gilded, stucco ceiling, was begun in 1530 and was completed in 1559. The Scala d'Oro was built to provide a grand entrance for dignitaries visiting the staterooms on the upper floors of the Doge's Palace. 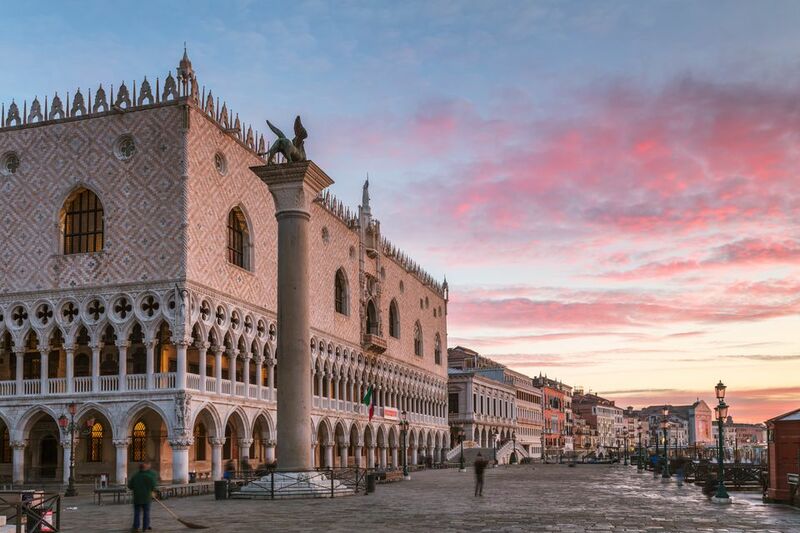 The Museum of the Doge's Palace, which starts from the Scala d'Oro, displays original capitals from the palace's 14th-century arcade as well as some other architectural elements from the early incarnations of the palace. Known as I Pozzi (the wells), the dank and barren prison cells of the Doge's Palace were located on the ground floor. When it was determined, in the late 16th century, that more prison cells were needed, the Venetian government began construction on a new building called the Prigioni Nuove (New Prisons). The famous Bridge of Sighs was built as a walkway between the palace and the prison and is accessed via the Sala del Maggior Consiglio on the second floor. The former residence of the Doge takes up almost a dozen rooms on the second floor of the palace. These rooms contain especially ornate ceilings and fireplaces and also contain the Doge's Palace picture collection, which includes spectacular paintings of the iconic lion of St. Mark and paintings by Titian and Giovanni Bellini. Here is the great hall where the Great Council, an unelected voting body of all noblemen of at least 25 years of age, would convene. This room was completely destroyed by fire in 1577 but was rebuilt with lavish details between 1578 and 1594. It contains an incredible gilded ceiling, which has panels depicting the glories of the Venetian Republic, and walls are painted with portraits of the Doges and frescoes by the likes of Tintoretto, Veronese, and Bella. This second-largest room on the second floor of the Doge's Palace was a vote-counting room as well as a meeting hall. Like the Sala del Maggior Consiglio, it contains over-the-top decorations, including a carved and painted ceiling, and enormous paintings of Venetian maritime battles on the walls. The cabinet of the Venetian Republic met in this third-floor room, in which is featured the Doge's throne, an elaborate ceiling with paintings by Veronese, and walls decorated with famous paintings by Tintoretto. The 19th-century English art critic John Ruskin said of this room that no other room in the Doge's palace allowed a visitor to "enter so deeply into the heart of Venice." The Senate of the Republic of Venice met in this grand room. Works by Tintoretto decorate the ceiling and two large clocks on the walls helped Senators keep track of time while they were giving a speech to their colleagues. ﻿The Council of Ten was a spy service set up in 1310 after it was learned that Doge Falier was conspiring to overthrow the government. The Council met in this separate room in order to keep track of the other branches of government (by reading incoming and outgoing mail, for example). Veronese's work decorates the ceiling and there is a large painting of "Neptune Bestowing Gifts upon Venice" by Tiepolo.